Author: ROOMS.bg , 2.2 km From Trigrad. Trigrad is located in the southernmost parts of the Central Rhodopes na1450m. altitude, south of Devon, amidst the unspoiled beauty and tranquility of nature. 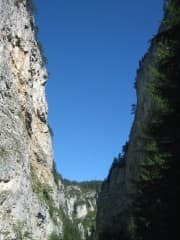 A mile north of the village is famous Trigrad breakthrough Trigrad Gorge, seven kilometers in length, but the real part is not more than two miles, the lowest point is "Beech Bridge" about 946 meters, and the high peak-tower 1543 meters . Before him and ordered Buynovsko Trun Gorge. 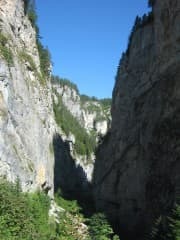 The picturesque canyon is cut by an impressive Trigradska river, which is absorbed by the Devil's Throat Cave and nobody knows where to go, after 530 m appears as a large karst spring and joins the river Buinovska. Impressive high hug otvestni cliffs along the river west wall is lower okolao180m. And eastern reaches 350 meters, it is like a tunnel distance between the first wall is about 300m., Eventually reaching 100 m .. In places, rocks bend menacingly over the road. There are two known caves open cultivated and secured for visitors. One is the pearl of the Rhodope-Yagodinska, one of the longest and most incredibly beautiful and the other is phenomenal and scary Devil's Throat. It is a dark room with a huge 36 meters height which hum with startling speed and flow of river water 40 meters high and form one of the highest underground waterfalls, unfortunately it is really very little. The path follows the river through the narrow canyon, pass before us as a band of beautiful panoramic views, spacious meadows alternate with ancient forests, steep limestone cliffs in rugged gorges, clear cold waters rushing to the river. The view is impressive, huge marble rocks everywhere and pressured us fear reigns. In this region have made a number of archaeological studies that show that here since ancient times, other parts of the Thracian necropolis and cave dwellings. Relics from the Eneolithic found in the cave Haramiiska proving that were occupied in this era, but the cave is not accessible to visitors or maybe just fans of extreme sports. In the vicinity are found around 150 caves are also unavailable. Trigrad gorge was declared a natural landmark and is listed as a hundred travel sites in Bulgaria. Here live more than a dozen species of rare birds so the area was declared protected in 1963. In the "Chairite" inclined there are several lakes, colorful meadows of green we can admire a rare flower-Silivryak possessing unique properties of ragweed, It brings about a local legend. When Orpheus wind blew even listened to his songs enchanting, the birds hush on trees and animals and beasts. When Bakhante singer broke and threw the body into the river, every drop of blood turned into a beautiful mountain flower. Nearby is no less magnetic and causing wonderment Buinovsko Gorge, magnificent rock cascades in places almost touching. Хората в Родипите са наистина много топли и гостоприемни, а природата им е уникална!